Called “one of the best saxophone players of the latest generation,” by the Italian press, jazz saxophonist Francesco Bigoni could have been stymied by moving to Copenhagen three years ago. But such a personable and creative advant garde musician could only move one way: forward. A largely self-taught improvisationist and composer, Francesco recently completed a 2-year advanced diploma in music performance at the Rhythmic Music Conservatory. He also fused two bands to form an Italian/Danish quintet, temporarily called Hopscotch Meets Crisco 3. And he released an album with the new trio Hopscotch on ILK records. This is the twenty-fifth album Francesco has played in, including The Cosmic Band’s Coming Tomorrow – Part One, which resulted in a vote of “band of the year” by the Italian critic’s poll. Francesco’s life in Denmark started after a holiday road trip with some friends to west Jutland and Copenhagen in August 2008. He met his future wife at a bar in Frederiksberg. “It was a fortuitous and romantic meeting in a pub, nothing to do with music,” muses Francesco. Less than a year later, he had moved permanently to Denmark. There are many things that captivate his imagination here: taking small trips outside of Copenhagen, the unwritten law of understatement and the bicycle culture. “After growing up in the Italian car culture, I am still amazed by being able to bike to rehearsal spaces,” the Ferrara native says. Too busy traveling and playing music, he skipped the free Danish lessons offered by the government and taught himself. He spoke to his wife, watched TV, read children’s books and did crossword puzzles. “The hardest part about learning Danish is getting the sound of it, which is crucial since Danish is pretty much sound-based,” states Francesco. As to whether living in Copenhagen has influenced Francesco’s music, you have to judge for yourself. Just hear him play at this month’s jazz festival or sound out his website. This entry was posted in Artists' Corner, Culture and tagged Copenhagen Jazz Festival, Jazz, jazzmusik, jazzmusikere, saxofon, Saxophone by California Robin. Bookmark the permalink. Om koncerten på Blågards Kirke i aften: Det er en meget fortaellende musik, meget lyrisk. Musikerne klaeder hinanden. Jeg elskede de store musikalske flader, jeg forestillede mig en danser i kirkerummet. Tonight’s concert with Hopscotch at Blågards Church roused both intellectual and sensory awareness. The musicians reached the outer bounds of what is possible. In his untitled piece, Francesco, who also experiments with clarinet, played only the upper half of the instrument. In his song called Freeze, Emanuele Maniscalco concentrated mainly on playing inside the piano, under the lid. 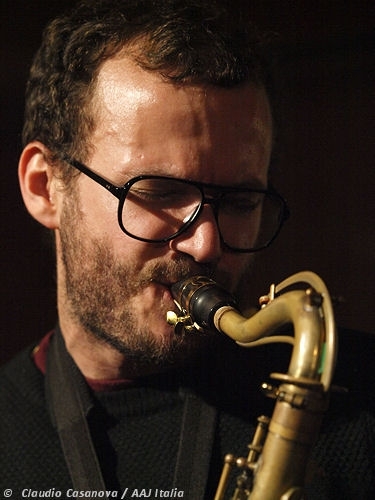 Hopscotch is a pleasure for anyone interested in experimental jazz.